With the fall weather upon us, we will all soon be cozying up in chunky cable-knit sweaters and warm knits. But did you know you can also bring that warmth and texture to your home decor? Upcycling worn out and thrifted sweaters is a fabulous way to reuse a favorite old sweater you don’t want to toss and add some depth and warmth to your space. Everyone needs more storage right? And many of us have at least one shoebox kicking around. So why not upcycle a shoebox and an old sweater at the same time? The first step is to cut up the seams of your sweater so that it’s one layer. You can cut off the arms along the arm seams at this point, too. Lay your sweater on a flat surface with the nice side down. Measure the perimeter of your shoebox (which is two times the length plus two times the width). If your box is 12 inches long by 6 inches wide, your perimeter measurement will be 36 inches. Now measure the height of your box and add an inch. For example, if your box is 5 inches high, your measurement will be 6 inches. Now cut a strip of your sweater six inches wide, making it as long as possible by using the largest part of your sweater. If it doesn’t equal the full 36 inches needed to wrap your box, cut another strip until you have enough fabric. Now, grab a hot glue gun and affix your sweater fabric to the sides of your shoe box, working quickly and folding the extra inch over into the box, creating an even and uniform top edge. If you want to finish it off, line the very inside of the box with a coordinating fabric using glue as well. File this in the “super easy’ category” If you have basic sewing skills and a spare button or two, you can whip up coffee cup cozies in no time. They are perfect as holiday stocking stuffers and are the perfect way to use the arms on old sweaters. Measure your favorite coffee mug or cup from your cafe of choice and determine how big your cozy will be. You probably want to leave about an inch from the bottom and an inch from the top. Now cut that length from your sweater’s arm! I mean, it’s already a sleeve for your arm – now you’re just going to use it on your coffee! It might be a bit loose to fit snugly around your cup—in which case, simply pull it tight, pin in place, and add a few stitches with thread or yarn. Make sure to do this on the inside of your cozy so the stitches don’t show when it’s in use. If desired, adorn with some spare buttons for added interest. For a project that is a little more advanced, creating a throw pillow cover from an old cable-knit sweater can save you a bundle. Typically, these types of knitted pillow covers retail for $100 or more, so if you have the skill and desire, this is a great DIY project. 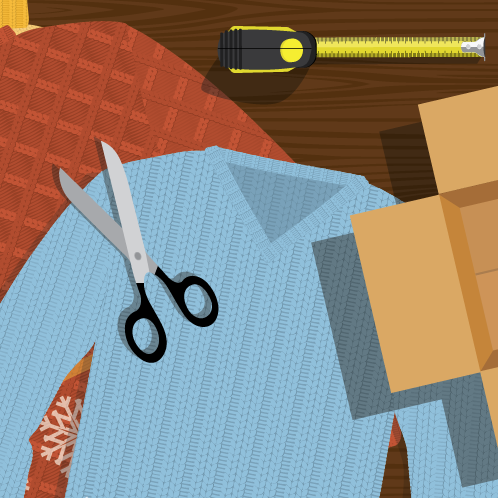 Lay your sweater out flat just as with the shoebox cover, “right” side up. A large or bigger sweater is advisable for this type of project because you’ll need quite a bit of material. Also, try to avoid a knit sweater with too much stretch, because that can make sewing and measuring difficult. Aim to cut evenly along the seams, exposing the largest possible area of flat material. Place a pillow form (a 16x16 is likely your best bet here), at the bottom hem of your sweater and then fold the material over your form to cover it completely. You should have a few inches of overhang on each side if your sweater is a large. Now simply sew a hem along the sides, leaving you with a pocket. Flip your sweater cover right side out, reinsert your pillow form, and hand-stitch along the remaining hem or add a zipper or button closure. There’s something about decorating for the holidays that makes you want to cozy up in a sweater and drink cocoa, so why not decorate with old sweaters, too? Now adorn your stocking with feathers, faux fur, felt pieces, buttons – whatever you’d like! In our house, we have sweater stockings with embroidered initials, so Santa doesn’t get mixed up! Lastly, it’s likely you’ll have scraps of sweater left over if you choose to do any of these projects. A really fun way to use them up is to cut them into shapes – leaves, stars, different-sized circles – and simply glue them in layers onto a prefab foam wreath form. If you have a long strand of sweater left, you can roll it up into a faux rosette to adorn your sweater wreath as well! There you have it! Don’t pitch that faithful old wool sweater if you don’t want to! Give it new life and add some cozy flair to your home this season.